Super Friends was a staple of TV entertainment from 1973 until 1986. The program inspired thousands of artists and writers for many years. Among them, artist creator Vance Capley, who has illustrated this wonderful new piece. What Was the Super Friends? Super Friends was a Saturday morning cartoon that featured a “kid-friendly”or “network friendly” version of the Justice League of America. The was produced by Hanna-Barbera and was based characters published by DC Comics. The name of the program (and the Justice League members featured with the Super Friends) has been variously represented (as Super Friends and Challenge of the Super Friends, for example) at different points in its broadcast history. From the vibrant colors to the action he saw on the tv screen , artist Vance Capley has tried to capture the excitement of the program he enjoyed as a child. Any fan of the TV program would greatly appreciate this piece. 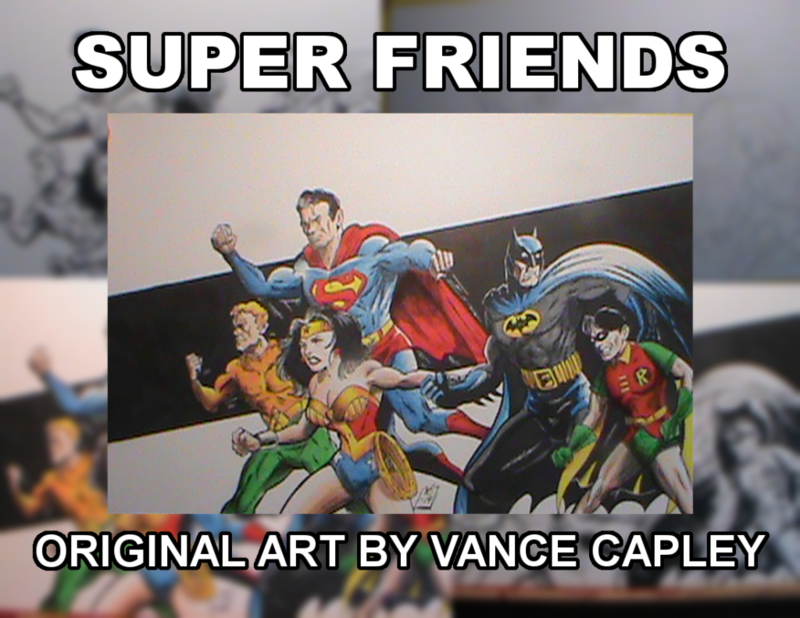 SUPER FRIENDS by Vance Capley is mixed media on 11×17 Bristol board. It is available for $50 plus $10 shipping.